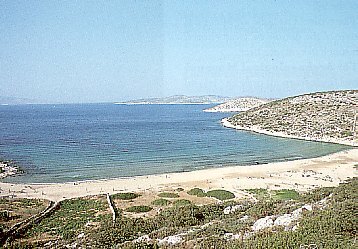 Heraklia is the western island of all in the complexion and is located between Ios and Naxos. Very few people live in this mountainous island with a lot of water and vegetation. It is divided in two settlements, Ayios Georgios, the island's port and Heraklia. You can taste the local recipies in the cafes and the picturesque taverns and ouzeries. It is quite common that music and dance will entertain you while eating. The ruins of the castle of Hercules. The cave of Ayios Ioannis, with beautiful stalactites and stalagmites. No cars are allowed on this island as well, you will go around by foot, using a donkey or by caique. Swim in the quiet unexplored beaches. You will get there by boat.